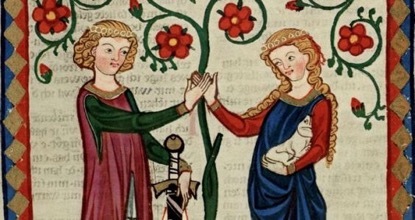 Marriage dowries in medieval times fulfilled many different functions. The dowry of a bride added to the estates of her husband and provided an income for his widow after his death at a time when there was no state pension. The size of a dowry also showed the wealth of the bride’s family. Evidence for marriage dowries in medieval Ireland survive from across the country. In 1454-5, Isabella, daughter of Henry Walsh, had a number of animals among the animals of her father which were reserved to Isabella as her marriage dowry. This article examines a number of references to marriage dowries among the published Ormond deeds. In about 1183-1195 Alexander de Alneto gave the manor of Chamele to William de Marisco on the marriage of his daughter Lucy to William. In return William de Marisco agreed to pay Alexander 47½ marks as an aid to marry one of his daughters. If Lucy died without children then William de Marisco was to have the manor at 6 marks of yearly rent. In April 1267, Agnes, widow of Henry Scurich, quit-claimed to Sir Ralph Pippard, and five others, the land formerly owned by Henry Scurich at Glasmore and Clonurin (both in Rathdowney parish) along with land at Killdelgi in the barony of Clarmallagh in return for 20s while reserving a third part of the property as her dower lands. In about 1282 Hugh Purcell quitclaimed to Sir Nicholas de Dunheved twelve librates of land in the lordship of Ardcroile, parish of Aghaboe, on the marriage of Joan, daughter of Hugh, to Nicholas. In return Nicholas gave Hugh land at Clonmin and Drummethan. Later Nicholas and Joan granted the Purcell lands at Ardcroile to Sir Ralph Pippard. In 1292 Edmund, son of Milo le Bret, quitclaimed to Sir Walter de la Haye and Alice his wife (who was Edmund’s mother) lands in the manor of Cnoctochyr (Knocktopher) which Alice held in dower. In June 1315, Johanna, widow of Sir Augustine FitzRoger, granted all her land at Lisconegan, which she held in dower to Sir Edmund le Botiller. In November 1331 Sir Roger de Pembroke granted lands at Cappagh, Ballybrennan, Ballysinun and other places in Stilylkar to Nicholas Cleyn and Margaret his wife, daughter of Sir Roger, for the use of their cattle but not goats as part of a dowry settlement. Another dowry settlement was made in 1335 at Clonmel. In June 1335, Caterina Walche (Walsh), relict of John Whyte, and her daughter Elicia granted all the lands and rents which John Whyte held in the burgage of Clonmel town as a marriage portion to Edmund Dowy. Sometime before October 1338, Johanna Severne acquired a third part of a messuage with appurtenances in Rosponte as her dowry on the death of Philip Severne, her husband. In October 1338 Johanna quitclaimed this third of a messuage to Robert Dobard and Edussa his wife. In about 1337 Philip Severne was sovereign of Rosponte. In 1369 Henry Kepagh, chaplain, gave two thirds of all the messuages, rents and lands he held in Kilblethyn (acquired by grant of Richard Moygne) along with the third portion held by Johanna Shirbourne as her dower lands which she got by gift of her late husband, Thomas Moygne, to Sibilla de Shuldham. If Sibilla left no heirs the whole property was to go to Thomas de Shuldham, junior and to other named sons of Thomas Shuldham. In January 1376, on the marriage of Alice Forstall to Thomas FitzJohn of Corestown, her father (Richard Forstall) and her brother (Geoffrey Forstall) agreed to pay Thomas twelve marks in silver as her marriage portion. Elsewhere, previous to 1384 a woman called Petronilla was married to Walter le Poer. When Walter died, Petronilla took seisin of a third of Walter’s estate at Rathgole as her dower property. She still held this third part after her marriage to William Kilrawyn. Meanwhile the government held the other two thirds of Walter’s estate as Arnald le Poer, son and heir of Walter le Poer, was a minor. When Arnald died, his brother Robert le Poer became next heir. In 1384 Robert le Poer took William Kilrawyn and Petronilla to court before the seneschal of the Tipperary Liberty claiming the full estate and that the third was not assigned to Petronilla as her dower lands. A jury found in favour of Robert le Poer and Petronilla was charged 10s as damages and was placed at the mercy of the court. Petronilla didn’t appear at court when summon which didn’t help her case. In 1390 Robert, son of John Gras of Erleystown quitclaimed to Walter son of William Coterell of Kells sixty acres of land at Kiltravyn which previously belonged to Johanna, wife of William Outlaw, senior, and William le Blound by gift of John Outlaw. These sixty acres were possibly part of a marriage dowry although the documents remain silent on this. In March 1402 Elena Coll granted to Geoffrey Coterell of Grana all her lands in Grana forever along with her lands at Shorthallstown. Also included in the grant was the reversion of twenty acres of land in the barony of Kells which Anastasia Tobin held for life as her dower property. This reversion may not have happened for several decades as widows sometimes long outlived their deceased husbands. We are not told what the relationship between Elena Coll and Anastasia Tobin was. Was Anastasia the mother of Elena or were they cousins or was it just a business relationship? The Coterell family held land at Shorthallstown since at least 1353 and Geoffrey Coterell may be a relation of Elena or Anastasia or both. In July 1439, Joan, daughter of William son of Philip Gibbon, granted the manor of Denghynmore in the barony of Kells along with messuages, land and tenements in the tenement Henry Whiteston in the same barony to James Butler, Earl of Ormond. Included in the grant was the reversion of the dower property held by Margaret, widow of William son of Gilbert Martyn, within the estate, which would revert to Joan on the death of Margaret. In January 1413 William son of Philip Gibbon had quitclaimed to William son of Gilbert Martyn eleven acres and three carucates of land with a further two acres in the tenement of Henry Whiteston which land was divided into five separate acres. The relationship between Joan Gibbon and Margaret Martyn is unknown just like that of Elena Coll and Anastasia Tobin above. But another land transfer of 1456 may suggest that the women were daughters and mothers in both cases. In November 1456 Katherine Roche, daughter and heir of Redmund Roche, late lord of The Rower, granted all her property in The Rower to Redmund Roche, son of John Roche, to have and hold by his male heirs. If Redmund left no male heirs, the property would pass to other male relatives of the Roche family. Included in the property transfer was the dower lands of Avelina, daughter of James Lysaght and mother of Katherine Roche, which Avelina held in The Rower. The Roche family had interests in the area around The Rower since before 1278. In September 1524 Philip, son of Walter Hacket, gave lands at Gragfyerik to Cornelius and Donatus, sons of William son of Matthew O’Karran, as a pledge of six horses and sixty sheep which was the dowry of his sister. In April 1526 Elena Walsh, alias Brenagh, the former wife of Thomas Purcell of Foulksrath, gave to Thomas Butler, son of the Earl of Ormond, a third part of all the lands at Foulksrath, Ballyroo, Culcrayn, Teganagh, Garran ne Parky and Suttonsrath along with a third part of the farm at Clynystown in return for a yearly income of 26s 8d. These lands were formerly owned by Thomas Purcell and were given to Elena Walsh as her dower property. The Purcell family had only acquired Foulksrath in the late 14th century when it came to an earlier Thomas Purcell by way of his mother Katherine de Fraxineto, sister of Geoffrey de Fraxineto. A widow giving away her dower land in return for an annual income saved her a lot of work in managing her estates, hiring staff, organising the planting of corn and harvesting along with keeping the buildings in repair. One of the last references to dower property in the Ormond Deeds shows a wife giving a lease on her dower property to an outsider while her husband was still alive. In 1550 Joan, Countess of Ormond, and her husband, Gerald FitzJames of Desmond, gave John Aylward a lease of five years in return for 60 bushels of corn, viz. 30 of wheat and 30 of oats along with summer sheep and a poundage hog with suit at the Grenagh manor court. Most of the non-Butler documents in the Ormond Deeds are usually once off pieces, or have a half dozen associated documents, and so tracing the history behind each dower reference is difficult. What they do show is that widows across the geography area of the Ormond Deeds were ensured their dower property by society and by their family for the most part. But there are apparent exceptions like a widow in Clonmel, Margaret Roche, instructed by an ecclesiastical court to return a messuage in Clonmel to an unnamed person, but in this case we are not told if the messuage was part of her dower property or if she had rented it in her own business. In later centuries widows didn’t appear to have the same rights as their medieval predecessors. With the state widow’s pension, the modern state has in some ways relieved the successor of the property from having a third of the property placed out of reach to the successor, for sometimes decades. May be in such terms the medieval world was not too bad of a place for a widow and our modern day sense of progress may be seen by some as reverse of progress.